1958 Born in Kazo-city, Saitama Prefecture. 1978 While in adolescence she was in pursuit of the truth for "What is a human being?" "What it is to live? ", at the age of twenty she was acquainted with the founding Director General Mrs. Yoshiko Nomura. As the chief of the Youth Division she took the leadership for several years. From 1984-1986 she studied in Canada and England by Nomura Center scholarship. After she came back, she was appointed as a secretary to Mrs. Nomura, as well as a staff of International Division. 1988 Married with Mr. Akio Kaneko. After they have a son in 1996, she became a member of Division of Infant Education with her son for six years. 2002 On the occasion of the 40th anniversary, she was appointed as the successor to Mrs. Nomura. And at the 9th International Forum, Mrs. Nomura introduced her as her successor to the participants from the World. 2003 Nov. 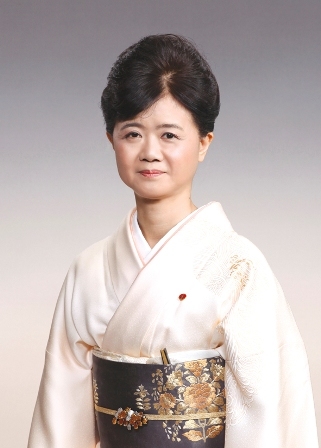 Demise of the Founding Director General Mrs. Yoshiko Nomura. On this very day the special board meeting was convened and approved her succession to the directorship. 2004 Arabic version of the book, "The Principles of Nomura Lifelong Integrated Education" written by the Founding Director General Mrs. Yoshiko Nomura was published in Egypt. 2005 Mar. Nomura Center received Ozaki Yukio Award by the Ozaki Yukio Memorial Foundation. She made a commemorative address under the theme "The role of Japan in the world - The essence of education and the raison d'etre of human being". 2005 Jul. Delivered keynote address for the first time at the Tohoku Regional Conference in Miyagi. Since then delivered keynote addresses at the 11th Miyazaki Regional Conference commemorating the 30th anniversary of the branch (December, 2005), the 5th Nagano Regional Conference commemorating the 30th anniversary of the branch (March, 2006), the 2nd Gunma Regional Conference (December, 2007), the 6th Shizuoka Regional Conference (March, 2008), the 12th Miyazaki Regional Conference commemorating the 35th anniversary of the branch (February, 2011), the 6th Nagano Regional Conference commemorating the 50th Anniversary of Foundation of the Nomura Center (February, 2013), the 3rd Gunma Regional Conference (February, 2014). 2006 Nov. Held the 9th International Forum on Lifelong Integrated Education at the UNESCO Headquarters in Paris and Injep under the theme "Lifelong Integrated Education Enlightenment on the Order of Coexistence - Wisdom for Crating our Future-" and delivered keynote address. 2009 May Invited Mrs. Maria Tzonkova, chief of the Bulgarian branch and another member to have to review meeting of the translation of the Bulgarian version of the Principles of Nomura Lifelong Integrated Education. The book was published next year in Bulgaria. 2010 Nov. Held the 10th commemorative International Forum on Lifelong Integrated Education at the UNESCO Headquarters in Paris and delivered keynote address under the theme "Lifelong Integrated Education as a Creator of the Future - Human Restoration of the 21st Century". The first book "Education that Links Continuity of Life" is published from Ichiyosha. 2014 Nov. Held the 11th International Forum on Lifelong Integrated Education 2014 in Tokyo and delivered a keynote address under the theme "Lifelong Integrated Education The Space Age-Awakening to the Unchangeable Values Our Responsibility to the Future". 2015 Nov. Held the 1st Miyagi Regional Conference on Lifelong Integrated Education and delivered a keynote address under the theme "Lifelong Integrated Education What is True Human Education? -As a Japanese living in a Global Society-". 2016 Feb. Held the 13th Miyazaki Regional Conference commemorating the 40th anniversary of Miyazaki branch and delivered a keynote address under the theme "Lifelong Integrated Education Crating New Values - For the Children in the Future". 2017 Oct. Held the 1st Saitama Regional Conference on Lifelong Integrated Education and delivered a keynote address under the theme "Lifelong Integrated Education Education for People Living in the Global Society -Creating the New Values-".